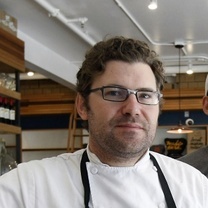 Jacob Des Voignes is the charcuterie at Local Mission Market. After bookishly researched cooking technique and history, read “White Heat” by Marco Pierre White, and learned that food could be art and not just a meal, he began his career in cooking. Soon after, the Northern California native replanted his roots in San Francisco at the Fifth Floor with Melissa Perrelo where he earned a Michelin Star. "The Sonoma duck breast with butter bean ragu, grilled broccolini and satsuma mandarin at Frances. The duck is perfectly cooked and the balance of flavors make this an elegant dish. Accompaniments change." "You can't go wrong with any of the pastas at flour + water. This one in particular has a great combination of sweet and earthy flavors." "It's worth the trip to Oakland for their exceptional ramen. My favorite is the garlic miso with ground pork belly, hedgehog mushrooms, a shoyu-marinated egg, scallions, and shungiku. It's very rich in flavor. This dish varies throughout the seasons and has been delicious each time I have eaten it. Go early; the wait for a table can be quite long." "Simple and decadent, with warm crab, butter and chive on a torpedo roll. This is one of the few spots in the Bay Area where you can sit bayside while eating." "The yuzu chicken wings at Ichi are simple but perfectly executed. The great crispy crust, brightness from the yuzu, and micro shiso complete the dish." "I love the texture and flavor of the sausage patty. Combine that with a brioche bun and runny egg, and you have a perfect start to your day."